Collecting wild turkey decanters often starts in an unplanned manner. But once you receive a gift or purchase an interesting decanter which shows the bird in flight or strutting its feathers, you may soon be drawn into the lure of collecting these bottles. There are more than 8000 collectible decanters that cover different subjects and aspects. From celebrities to sports and waterfowl to Christmas, there is an unimaginable range of decanters available for collectors. You may select bottles based on a particular brand or even a series issued by a manufacturer or a particular bird like the wild turkey. There are many guides available for bottle collectors and these provide useful information on the value of the decanter you’re willing to invest in. These bottles are generally available after being drained because any liquid inside will corrode the China from the inside thereby ruining it. A full bottle does not sell for a higher price because the value is in the bottle and not the liquid. When purchasing a wild turkey decanter check out the shape and condition of the bottle. It should be in mint condition and you should value it against the different price guides available online. The China should not be chipped or cracked and the parts of the decanter should be complete. Make sure you check the seller’s reputation before purchasing a wild turkey decanter. 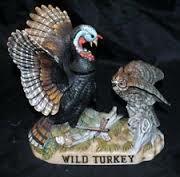 There are many trade and selling boards which let you purchase wild turkey decanters through auctions. You can find wild Turkey decanters which feature the birds standing alone, on a log, or with their wings spread out ready for flight. You must take good care of your collectible wild Turkey decanters. These are often created out of fine China, porcelain or glass and therefore must be treated in a fragile manner. Dust them frequently and wash them occasionally with liquid soap. The old wild Turkey decanters of a color that is fired in will not lose their luster and original color from washing. However, those created prior to 1955 have cold paint. Be careful not to scratch off the manufacturer’s label because labels are used to authenticate your collector’s piece. The wild turkey decanters come with stoppers which can be either created out of screws or cork. Make sure you lubricate the cork to prevent it from hardening and drying into the bottle spout. When thinking of what can be considered as a collectible decanter, look for pieces which are unique and rare. Commemorative issues and wildlife decanters which have wooden bases, accessories made out of wood or leather or feature a music box can be considered unique wild turkey decanters. Each of the decanters carries the labels of the manufacturers on the front or the bottom of the piece, along with the name of the product and designer. For limited edition pieces, the series and production amount is also mentioned. However, it is difficult to trace antique wild turkey decanters, especially from Europe, but well worth the effort.